The passing of chief archivist of Nazi crimes is also the end of an era. My most distinct memory of Robert Wolfe was that day in October of 1999 when he stood in the dreary, grey rain outside a heretofore unknown archive in Sindelfingen, Germany, a suburb of Stuttgart. He was attempting to gain entry when the archive unexpectedly shuttered its doors and refused him. With the chilled drizzle running rivulets down his cheeks, Wolfe summoned an intense inner anger, born of decades of devotion to documenting Nazi history. He shook with disbelief and demanded they open the door. They would not. No matter. Despite that refusal, Wolfe persevered, and the information was revealed. Who was Robert Wolfe? 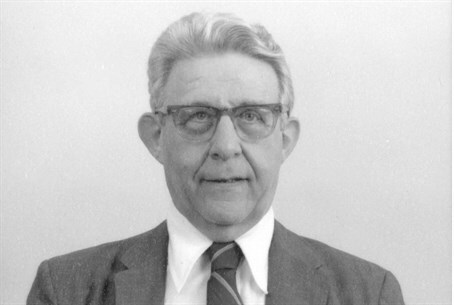 Wolfe was the irreplaceable chief archivist for captured Nazi documents at their main repository, the National Archives and Record Administration in Washington, D.C. He died just before dawn December 10, 2014, at the age of 93. Wolfe, who lived in Alexandria, VA, left behind his gentle German-born wife, Ingeborg. They met when she was an office manager in Occupied Germany where Wolfe was stationed. During Wolfe’s archival career, Ingeborg traveled with him extensively. Two sons also survive Wolfe, one in Virginia and the other in Florida. The pragmatic Wolfe ruled out any funeral in his final instructions. His wish for interment at Arlington Cemetery will be granted in spring 2015. With Wolfe’s death, a legacy also dies. Wolfe set the standard, hammered together the ethical strictures, and single-handedly galvanized a generation of Holocaust and Nazi-era historians and authors — including me. So this remembrance is actually my back story, which in large measure is part of Wolfe’s front story. First and foremost, Wolfe was a fighting man. He fought in both the Pacific and European theaters and used to brag that he survived separate head injuries in both campaigns. Those injuries just hardened him. Fresh from his second head wound, while in France, Wolfe was assigned to the Nuremberg War Crimes prosecutor’s office, where he became familiar not only with the infamous testimony now published in many volumes of the Nuremberg Trials, but also the many thousands of linear feet of evidentiary documents that, to this day, remain largely unexploited. These are the millions of pages of letters, memos, telegrams, reports, notes, and other documents that chronicled the enormous case of genocide brought against the Hitler regime and provide eternal proof of the crimes. Later, Wolfe helped microfilm the voluminous documents. With a team, he created the mammoth Nazi-era archives both at the Berlin Documentation Center in Germany and the National Archives in downtown Washington, D.C. Later the files were transferred to Archives II in suburban Maryland. A generation of fact-thirsty historians made pilgrimages to Wolfe’s jail cell-like offices at the Archives, where each austere room was blocked by a locked cage door with attached room-to-room sign-in and sign-out sheets. Typically, the process went like this. First, the historian would enunciate his topic. Second, Wolfe would reach into his user guides and the recesses of his personal memory, fetching 10 or 20 linear feet of files at a time for review. The historian’s relentless folder-by-folder search would ensue over many long, mind-numbing hours and days. As the nuggets were uncovered, the focus sharpened, and the conclusions were honed and re-honed. Wolfe would provide midcourse corrections along the way. Many award-winning Holocaust historians began their project like this and went on to produce major published works. Many achieved a great measure of recognition and success in their field. Wolfe’s name was often relegated to a mere mention in a long “thank you” list embedded in the book’s acknowledgements. In my case, at least two projects were revelations to both of us. I first came to Wolfe in the early 1980’s, when typewriters were still king. Together we explored the undiscovered workings of a complex economic arrangement between the Nazi finance authorities and the Zionist Organization to rescue Jews by transferring them and their assets to Jewish Palestine. This was the Ha’avara Agreement which led to my first book, The Transfer Agreement. At the time, few discussed the economic underpinnings of the Holocaust. Doing so caused shock waves. It was Wolfe who taught me lonely courage, metal-laced scruples, fearful caution, and indefatigable diligence in archival and historical endeavor. He also taught me how to split hairs in pursuit of accuracy. Indeed, Wolfe helped me every step of the way on that first book, validated my findings, held my hand, palm to palm, and pushed me through the door toward the loneliness of the historian who answers only to history and allows only the future to judge. He taught me that he who holds the torch, often scorches his own arm. Subsequently, Wolfe and I worked together on many other projects over the years. Most salient was my discovery that IBM had consciously co-planned and co-organized Hitler’s Holocaust using the company’s advanced, customized punch card technology. Wolfe had just retired from the National Archives when I embarked upon that project. He agreed to help me find the documentary proof to illuminate the unthinkable. He travelled with me through Germany as we visited archive after archive in pursuit of heretofore unknown documents. Known everywhere as an eminent archivist and the principal custodian of the Nazi papers, we received special and expedited access to all files held by the many private and public repositories scattered across Germany. When Wolfe appeared, many doors instantly opened. After any day’s eye-straining work, we would gather with the local experts to compare notes and distill our discoveries. With Wolfe at my side, many German archives launched their own searches and forwarded information. One day, near the end of our search, we had stealthily arranged to visit an unknown IBM archive and museum devoted to punch cards, quietly maintained by aficionados of the technology in a company facility in Sindelfingen, Germany, near Stuttgart. The files were uniquely extraordinary, comprising the Nazi-era customer communications and technical client advisories, outlining how to achieve, step-by-step, Hitler’s tasks of systematically persecuting and destroying the Jews. These included customer newsletters, diagrams explaining the complex sequence to run the punch cards in order to convert raw information into desired results: Where were the Jews? Where did they work? Where were their assets? How many were left? Our appointment to visit the museum was set. But at the last minute, IBM headquarters in both New York and Paris learned the nature of our mission. When we showed up at the appointed time in the pouring rain, we were informed through the surreal medium of an external security door intercom that the archive and museum had been suddenly and permanently shut down. We could not even come inside to discuss it. We stood there without umbrellas in disbelief. With the hard-chilled rain drizzling rivulets down our cheeks, Wolfe summoned an intense inner anger born of decades of devotion to documenting Nazi history. He shook with disbelief and demanded they open the door. I remember the moment. “In the name of history, open this door!” he bellowed with his deep, gruff voice. I joined him. Each of us said it over and over again. “In the name of history, open this door!” IBM would not. No matter. Despite that refusal, Wolfe and I persevered. Ultimately, the information indicting IBM was assembled, verified, cross-checked, vetted by several dozen historians, and revealed to the world in meticulous detail. IBM and the Holocaust was released on February 11, 2001 in forty countries on a single day, at a single hour adjusted for time zones worldwide. The irrefutable documentation, backed up by thousands of highly-organized, cross-indexed documents from many archives now reposing in my Rockville office, would not have been possible without the unique expertise and invaluable assistance of Robert Wolfe. There are many other such compelling stories to be told by many other writers and historians. Aronson’s acknowledgment tribute is replicated in many works in many languages. Mine also. With Wolfe’s passing, so passes a special quality at the National Archives - the specialist. In days gone by, the Archives was staffed by great experts, each of whom knew the inner molecular makeup of certain realms of investigation that they intensely studied: the camps, the ghettos, the battlefields, the trains, the economics, the diplomacy, the Nazi Party inner workings — all the many dark sinews of the men, monsters, and methods that made Hitler’s war against humanity what it was. These experts have mainly retired or died off, and the remaining cadre have now been relegated to the status of “generalists,” a little of everything. Often these archivists are not assigned to help inquirers based on their specialized knowledge of a narrow topic but rather their availability in the queue. The result is the loss of the irreplaceable experts like Wolfe who knew the deeply submerged facts about the Third Reich and how to document them. Many users fear that the new crop of archivists will not be the go-to giants, they will be just clerical searchers consulting cards and user guides. I have lost one of my most reliable friends. The National Archives has lost one of its most precious resources. But mostly, history has lost a most valiant soldier. Edwin Black is the author of eleven award-winning books, including The Transfer Agreement, IBM and the Holocaust, and his most recent book Financing the Flames.